It is nearly ninety degrees today. This means that I finished a wool sweater. It also means that you have to settle for this lousy indoor photo. Yes, I finished my Arwen. I knit this without the hood. Instead, I worked i-cord around the neckline. I like the way it turned out, but I was worried. The unique construction of the sweater made it difficult to see if I had knit the correct size for me until I had finished sewing it together. It will be a wonderful sweater to wear. However, it will be waiting quite some time to get much use. I enjoyed knitting this well enough that I could possibly knit another one some day. I knit this using Knit Picks Wool of the Andes in the color Hyacinth. I used my Knit Picks Options. The lovely points on those needles made cabling without a cable needle easy. I really do like this cardigan, and I might knit this again in a cooler fiber so that I can wear one in warmer weather, too. It was another wonderful day at the mailbox. My Sock Madness prize package arrived. Thank you so much, Hillary and Felicia! Everything was packaged so nicely. This 100% Blue Faced Leicester yarn is so beautiful and soft. The stitch markers are gorgeous. I brought the chocolate to a family gathering to share and we all loved it. I cannot say enough wonderful things about Sock Madness. It has been such a fun experience. I can't wait to see the remaining patterns. Round 5 begins on Friday. Best of luck to the Elite Eight! Check out these peachy keen Mad Cows I won! They fit me wonderfully and I love them. Thank you so much, Stephania! I don't recall which day they arrived, but I was so excited when they did. You remember that achy back of last weekend? It got worse. I spent Monday evening at the ER and left loopier than I have ever been. They shot me in the behind and gave me an assortment of pills. The last week is a bit of a blur. I did not get much done, and should have attempted even less. My advice to everyone: Seam Sober! I somehow thought it was a good idea to sew my Arwen after taking those silly pills. Now I must undo those seams before I make another attempt to put my Arwen together. Anyway, I am way behind on everything. I'll get caught up eventually. The weekend seems to have dragged on forever, but I did not accomplish much of what I had hoped to do. I had hoped to finish knitting Arwen. It was not to be. I put in a good bit of time on it, but ripping out those twelve rows set me back more than a bit. I have made it to the point where I am just knitting back and forth on the long sleeve rows. Then it is the complementing set of short-rows, and I am nearly through. I am not knitting the hood on this because I do not want one. I have also lengthened the cardigan a bit. I was not sure how much longer I would make it when I finished the back. I did not bind-off the back in case I need to knit more or rip back some. I will probably knit on Arwen after I finish writing this. Completion of my cardigan is not the only thing I was unable to do this weekend. I missed a birthday celebration of one of the Skanky Knitters on Saturday. Weather was lousy. The wind blew, the rain poured down, and the thunder rumbled. We did not even turn on the computer until Saturday evening. It would have been a good time to knit furiously on Sock Madness socks, but I would have been rattled to not be able to obsessively check the competitors' progress. In this way, it was a relief to have been knocked out of play. Still, the weather was not all that stopped me from participating in the festivities. What has given me the biggest grief this weekend has been my back. It has not been as bad as other times, but it has seemed that at any moment I could be in big trouble. I spent much of the weekend brewing herbal tea to help warm me while I applied cold packs to my back. Once or twice, I was able to stretch my back using my stability ball. If I had felt a bit stronger, I would have done a gentle, beginner yoga dvd. However, I could tell that I was not up to it, so as I worked to achieve the proper balance of not sitting, lying, or standing for too long, I knit. After I had done as much Arwen as I could stand, I knit a new chemo cap. I used a stitch pattern from Charlene Schurch's Sensational Knitted Socks. I knit this hat using Plymouth Dreambaby DK. I love this hat. It is soft and stretchy. I think it will be a good fit for just about anyone. I can see myself knitting more of these. I am unsure of my next hat pattern. Maybe I will choose another stitch pattern from this book. I have been flipping through many sock patterns lately. I am in search of inspiration. I will be engaging in some super-secret knitting soon. I have joined Sockapalooza 4. This is my first time participating in Sockapalooza. I hope to do well and not be a Sockapaloozer. We will get our matches soon. Then I will do more research, and begin knitting. I want to complete these well ahead of the deadline just in case life happens later. I also have some more super-secret knitting to begin. It is unlikely that the intended recipients read this blog, but I will not show you until much later, just in case. Because I am preparing to knit so much for others, I must definitely have some things on the needles for myself. I have Arwen near the finish line. It will be a race to see if I can finish her before the weather turns so blazingly hot that I cannot wear her. For warmer weather wearing, I have Festive on the needles. I am knitting this top in Cotlin in the Moroccan Red color. It seems that many people are interested in this yarn. I want to finish this shirt and wear it so I can share more of my experiences with this yarn with all of you. So far, I give this yarn a positive score. I liked knitting with it when I used it last month to knit an Odessa. It held up well to the abuse of the beads. There is not much point in taking a picture of the knit at this point. I am working my way up the back. I have worked the waist decreases and am now increasing again. The fronts will be interesting to knit. If I follow the pattern as written, I will be knitting the seed stitch bands using smaller needles at the same time as I knit the stockinette portions on larger needles. I think my Balene II dpns will work perfectly for this. I may knit the sleeves a wee bit longer than what is written in the pattern. My greatest worry for this shirt is that I did not choose the right size. It will not be such an ordeal if I need to rip the whole thing out and knit it again, but I would rather get it right the first time. Shedir is the most beautiful chemo cap I have knit. I would knit this pattern for a loved one. I think it is very special, and I love including it in the rotation of patterns I knit for Caps for a Cure. In fact, here are some pictures of my latest that I neglected to include in my last post. I knit this one using Sinfonia. It is a 100% mercerized cotton yarn. I liked using it, and love that it is a readily-available, economical option. I could go on and on about the ways I adore this hat, but instead I will get to the point of this post. I would like to challenge you to knit a Shedir to be donated to Caps for a Cure. Knitting this hat makes you feel like a Knitter with a capital K. It is a bit more complex than other hats I have knit, but the pattern has clear, well-written instructions. In conjunction with the challenge, I am offering prize-y goodness. I have been compiling goodies for this, and I think you will be pleased. Not only can you have the good feelings from knitting a challenging pattern and donating it to a worthy cause, you could be a winner. So, go ahead and knit a Shedir. You can send it to me or directly to the sponsored center. This round goes until the end of May. Just email me when you finish knitting your Shedir, and I will send you the details. These are the words of my niece. She would be making this declaration if she were here. Right now, my home is definitely stinky. The odor of hard-boiled eggs and vinegar lingers. I am thankful that we dyed only the eggs. My nephew did a great job. He is a bit disappointed by the fact that his creations will be cracked open and eaten. The next strike against these eggs is that they are filled with egg, rather than candy. He assures me that he has a stash of plastic eggs ready for candy. I wonder if my sister knows about them. I have a long overdue fo waiting for better weather to show you. I have begun something in Cotlin. Arwen is about have long rows again as it is time to add the sleeve. I could actually finish her soon. I will fill you in with some more details. Oh, and before I forget, I have another Shedir completed. I have some ideas about more of those. Do not be too afraid. It is something good. 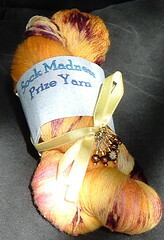 Kristi’s birthday coincided with the release of the Round 3 pattern for Sock Madness. She posted the photo of her completed socks about twelve hours after we received the pattern. Quite a fast knitter has knocked me out of the competition. Perhaps this is proof that the birthday wish is powerful. I will admit to feeling a bit bummed. Sock Madness was fun. At least I was brought back down to earth, and no longer feel the need to sign up for the 52 Pair Plunge. I suppose it is just as well. I told the Skanks that this pattern makes my ankles look fat. I do not know if this is true, or if my mind is just trying to find ways to cope with my failure. Don’t worry kids; I am okay. I can now move on to the next adventure, whatever it might be. Still, I may need to frog the socks for therapeutic purposes. I also have the rest of the patterns to look forward to without the strain of competition. I might not have been ready for the pressure. I am still glad that I joined in on the game, though. Best of luck to the remaining competitors!